Merlo Merlo, based in Worcester can entertain children from Birmingham all the way down to the Gloucester area. We cater for all ages from 4 years upwards and tailor each show for different age ranges making the shows unique for each audience. The children’s party packages start from a 40 minute Magic show to a full two hour children’s party which include magic, party games with music and giveaways during the show. Are you getting married soon? 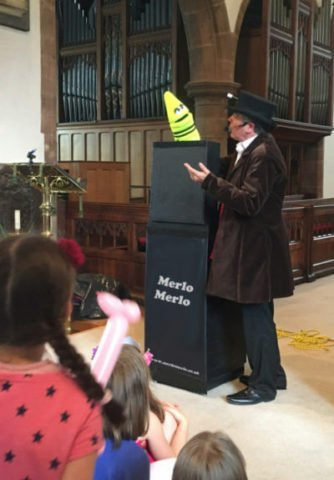 Merlo Merlo can entertain the children whilst the reception is taking place, leaving you to relax knowing that the children can scream and shout and be entertained away from the main area or room and speeches. Merlo Merlo is also available for Naming Ceremonies or Christenings. For Weddings, Christenings/Naming Ceremonies please contact us for a price. You are only a phone call away from booking an entertainer your child will be laughing and talking about for years to come! Although our prices are shown, we are happy to try and find a way to work within your budget. For more details please phone us on 01905 425577 or phone or text us on 07429 549045. Alternatively feel free to use the contact form on our contact us page.